Caller Identification: By leveraging Whitepages’ proprietary data set that includes more than 600 million active mobile and landline phone numbers in the US and over 1.5 billion unique numbers globally, users will be able to make informed decisions about whether or not to answer an incoming call. Spam and Scam Detection: With Whitepages’ state of the art phone reputation service, users will have much needed context for unsolicited spam and scam calls, giving them peace of mind when answering or ignoring a call. The service also includes a spam button for users to easily report spam numbers which will in turn, help other users from falling victim to fraudulent calls. With this partnership, Samsung will provide a better phone experience that not only identifies unknown calls, but protects Galaxy S7 users from phone spam and scams. The issue of caller identification has come to the fore in recent years as phone scam and text spam has significantly increased due to a lack of filtering at the carrier level and a rise in automated VoiP /OTT platforms that have driven the cost of communication down to fractions of a cent. Of the 300 MM incoming calls that Whitepages scans per month in the US, more than 15 MM are classified as “unwanted”. In addition, in December, Whitepages released its annual “State of the Unwanted Call” report which revealed a 35 percent growth in spam and scam calls in 2015, as compared to 2014. With this partnership, Samsung joins the ranks of T-Mobile which announced a partnership with Whitepages last year to bring the company’s caller identification and spam/scam protection app, Name ID, to T-Mobile phones. These partnerships with world class handset manufacturers and telecommunications companies are further affirmation that Whitepages is the vanguard of scam detection technologies and is the first line of defense for consumers’ mobile phones. The new Whitepages caller identification and spam and scam detection features will be available when the Galaxy S7 launches in Australia, Brazil, Canada, France, Germany, Hong Kong, Israel, Italy, Mexico, Philippines, Singapore, Spain, Sweden, Turkey, the United Kingdom, and the United States, with additional countries to come. The Samsung partnership adds to Whitepages’ suite of Caller Identification apps from its Whitepages Caller ID for Android to its Caller ID for iPhone to its recent revamp of its Mr. Number app. To learn more about mobile partnership opportunities with Whitepages, please visit http://about.whitepages.com/partners/. Whitepages is the leading source for caller identification and phone spam detection in North America. With a database of more than 600 million mobile and landline phone numbers in the US, and over 1.5 billion unique numbers in its global database, Whitepages leverages its extensive data insights to identify unknown calls and texts and to monitor phone-based threats for consumers and businesses. Whitepages scans more than 300 MM incoming calls per month, and has detected more than one billion robo, telemarketing and scam calls and texts to date. 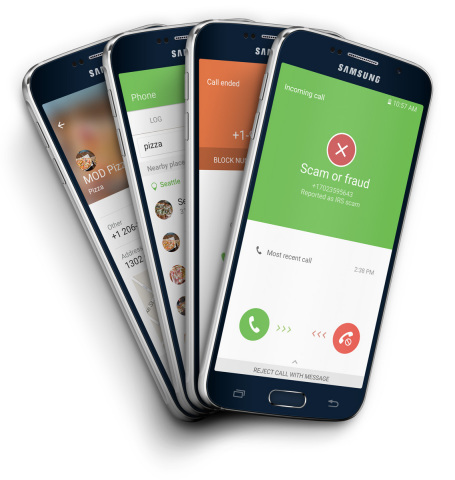 Whitepages partners with Samsung to bring its leading caller identification and spam detection service to the new Galaxy S7 via a seamless experience. The service will be available in 16 countries.